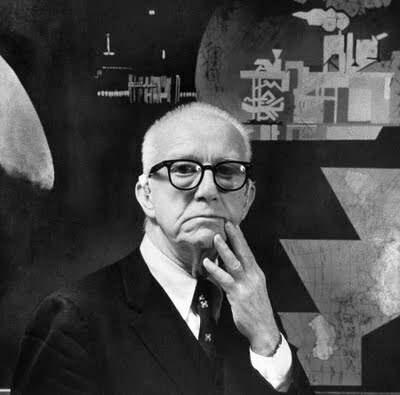 Four hundred years after Durer and Kepler, Buckminster Fuller continued a similar process of experimental observation of structure in three dimensions. Fuller’s approach to design was influenced by his Navy experience. During a long introduction to the design of ships on the sea, Fuller paid attention to designs which contained new angles and curves in order to navigate through a continually shifting, fluid medium. In his earliest writing, a 1928 document titled “Lightful Housing,” he introduced a “Theory of the Spheres.” In this paper he contended, “all matter in unforced state is spheroidal not cubistic, and these spheres are expanding for the life of their existence at a fixed rate.”15 A very different version of this essay appeared in Fuller’s self-published 1928 book titled “4-D Timelock.” For the rest of his life he unraveled this way of looking at the earth from a spherical perspective. Finally in 1975 and 1979 respectively, Fuller released Synergetics and Synergetics 2 presenting the complete system of dynamic geometry from which he derived the geodesic dome, his icosahedral map and his octet truss building system. For Fuller there were no flat planes. Everything was curved, from space to shape. Everything was in motion and was continually shifting. But the classical shapes remain as guideposts to form found throughout the Universe. His approach the same problems that earlier geometricians and artists tackled by “tiling the plane” or building polyhedra was through the closest packing of spheres. 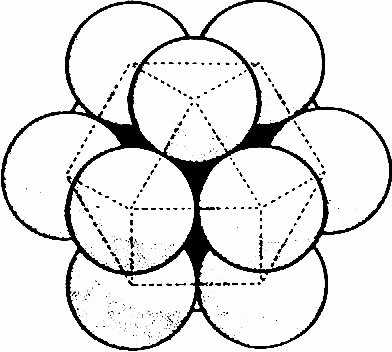 Delineating vector lines within closest packed spheres, Fuller defined the basic polyhedra that could be used as dynamic building blocks on a larger scale. Fig. 986.161 Diametric Unity: The vectors of the isotropic vector matrix interconnect the spheric centers of any two tangentially adjacent spheres. The radii of the two spheres meet at the kissing point and are each one-half of the system vector. Unity is plural and at minimum two. Drawing a line from the center point of each sphere to the center points of the others, you will inscribe a vector triangle. But that “system” of vector relationships does not have an inside and an outside. If you place a sphere on top, centered on the three spheres and connect the centers of each of the three to the center of the top one, you will have four vertices — a tetrahedron — the simplest “system” with insideness and outsideness. Fuller started with the topology of closest packed spheres to map the vectorial relationships between them. He always worked in three dimensions, never two. Unlike the geometers before him, Fuller did not start with a point, then a line, then a plane to which he then added dimension. He started in the center of the sphere and out in all directions. The lines or vectors represented energy, direction and time. As space-fillers, tetrahedra cannot pack together. They will instead insist on twisting into a “tetrahelix” — a helical structure made of tetrahedrons which expands in either direction. The same could be said for the octahedron if you tried to stack one atop another. In addition, if you truncate each of the four points of a tetrahedron, you will have a beautiful octahedra laying on its side in the middle. But if you pack tetrahedrons and octahedrons together, you can fill space with ease. 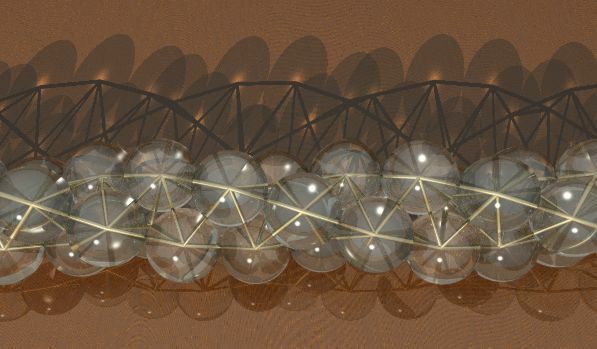 The presence of 60-degree angles within a lattice of tetrahedrons and octahedrons gives the final structure an inherent cross-bracing in all directions. 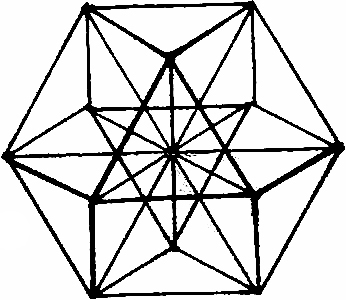 Fuller found also that if an octet space filling truss was built outwardly in successive shellings it would result in a successive series of nested polyhedra, the tetrahedron, octahedron and the cuboctahedron, or “vector equilibrium” (with six square faces and eight triangular faces on its outer surface) replicating the structures of its components on a larger scale. He called this larger trusswork an “isotropic vector matrix” because the angles and strut lengths were everywhere the same. Fig. 222.30 Volume Of Vector Equilibrium: The volume of the vector equilibrium consists of eight tetrahedra and six half-octahedra. Therefore, the volume of the vector equilibrium is exactly twenty. Isotropic vector matrixes were known and described well before Fuller named them such. Coxeter published a picture of a tetrahedral octet matrix he called “solid tessellation” in a mathematics publication as early as 1939.16b Matila Ghyka, in his interdisciplinary masterwork of 1946, The Geometry of Art and Life showed a similar image called an “isotropic partition of space by four sets of planes” in a section on closest packing and the cuboctahedron. Although Fuller was not aware of Coxeter’s solid tesselation, there is evidence that he was familiar with Ghyka’s. So what was so different about Fuller’s isotropic vector matrix? Through it, he introduced this matrix of 60-degree angles as a model of primary coordinate system from which all other systems could be generated. In addition, Fuller attempted to effectively replace the platonic and Archimedean “solids” as vectored “energy systems” and built them with struts with flexible connectors in order to demonstrate how they transform from one shape to another in time. In a closest packed group of 12 spheres around one, a vector equilibrium can be inscribed. Fuller called his simple vector equilibrium, when made out of flexible hubs and struts, a “jitterbug” because it twisted to exhibit, while in continuous motion, a series of shapes which accommodate and transform into one another. In its most open stage, it is the cuboctahedron. If it is twisted and contracted, it will become an open icosahedron with six struts missing and with one more contraction it will become the octahedron. It can then be folded down further into a tetrahedron and finally to a simple triangle. Then, simply unfold, untwist and the jitterbug pops back to its original shape, the cuboctahedron or, in Fuller’s dynamic system, the Vector Equilibrium. The key to Fuller’s jitterbug was its ability to embody and demonstrate the “motion” and transformation of polyhedral forms. Fuller’s jitterbug could be considered the first polyhedral model in more than two thousand years of mathematical and structural exploration that can demonstrate the energy characteristics of expansion and contraction. Because of the natural twist, like the spiral of a nautilus shell which draws its form from the mathematical rules of golden proportion, the jitterbug in motion can move through symmetrical forms which, if omnitriangulated internally, will span the oscillating continuum of symmetrical and asymmetrical form. 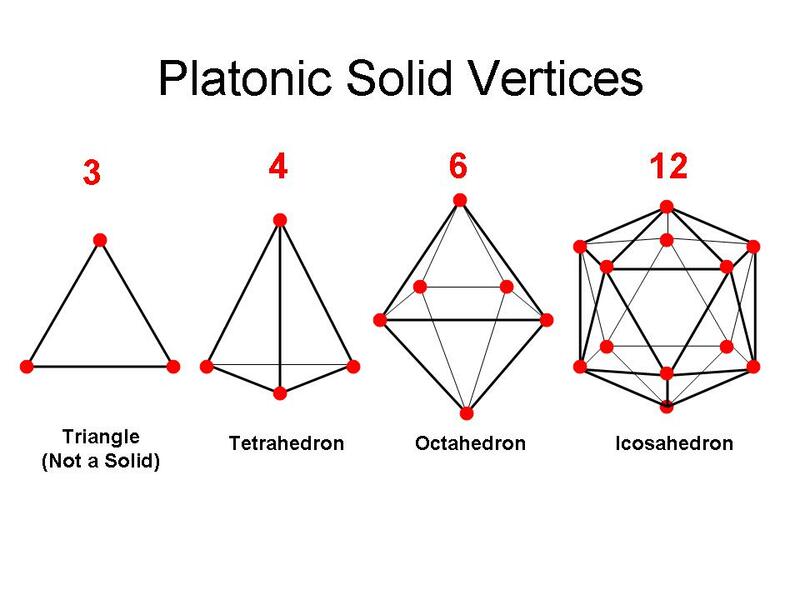 In all of its manifestations, two interpenetrating tetrahedra have represented the most important fact about the tetrahedron — that it is the only regular polyhedron that is its own self-dual with exactly the same number of vertices as faces. Fuller placed his duotet as the energetic corollary to his vector equilibrium and allowed it to replace the cube in his synergetic geometry.